According to Time & Date, the Moon was supposed to set at 9:31 pm on September 2 in Saskatoon. That is a significant discrepancy, KM. Thanks for posting. Thanks Howard. Great explanation. It will help lots of people understand a complicated topic. It helped me understand the earth wobble better too. I appreciate the info. thanks howard for this info. Can someone check out this site http://www.ssec.wisc.edu/data/geo/index.php?satellite=fy2e&chan... . In particular the images in .KALPANA,MET-IODC,FY2E and GOES 12. with the 8 image and full disk. I think they are showing the wobble and feel queasy watching. I dont know how to cut and paste the current simulations and these will of course change throughout the day. I dont really know what Im looking at or if its just showing a computer glitch. The FY2D 8 Image Animation is even more pronounced. It is unclear if this is an anomaly or evidence of the wobble, but it has been ongoing for some time. A proactive approach would be to contact SSEC and request they add an explanation of this apparent wobble to their FAQ page. Patricia, complementing the excellent explanation of Mr. Howard. The onset of severe wobble, be strong, Planet X will be visible to all, will be many degrees apart in the sky, as the sun, moon and stars, according to the day or night, you will not be denied that everything has begun the process of the last few weeks, as the Zetas have predicted. If you live near the coast, please leave there in advance, who they are when it starts there, will have no greater chance of survival. Patricia - Además del sol que es salir de la posición en el cielo, las líneas de costa será asaltado con las mareas inmensas.
" La severa oscilación traerá un doble de un columpio días, que no es la hora del cambio de polos, pero es un movimiento de 12 horas. Estas mareas se puede esperar que haya cientos de metros de altura, 200-300 pies, lo peor es que un normal de la marea bajo la influencia de la Luna está en proceso durante la oscilación. " Gracias, pero por favor no dicen cómo hemos de discernir con precisión el día 1 de los 9 días de severa oscilación? Julia - Planet X has been moving from under the Sun in a retrograde orbit (from right to left when facing the Sun), rising upwards toward the ecliptic and rolling its magnetic N. Pole upward, increasingly pointing it in the direction of Earth. While moving past the Sun's S. Pole, the magnetic poles of Planet X are subject to the dominant magnetic flow lines of the Sun. It is not that the magnetic poles of Planet X are swinging more erratically, it is Earth's magnetic N. Pole that is increasingly attempting to avoid the hose of magnetons emanating from the N. Pole of Planet X that is relentlessly approaching. forgive me, I am seriously trying to visualize the wobble! I understand the magnet/deflecting the compass point to the west senario, but you 'pull the magnet away quickly and the compass point will bounce back and forth and settle back on the N. pole.' Does PX have a wobble of its own that allows this to occur?/ It seems to me that the N. pole of PX aimed at earth would keep the earths N.pole tilted away with no chance of rebounding back.....Can you explain this aspect of the earth wobbleing back and forth? This blog is intended to provide a rough visualization of the Earth Wobble. Obviously, a compass and another magnetic object on a table are no substitute for the highly complex and ever-changing dynamics between Earth and Planet X. 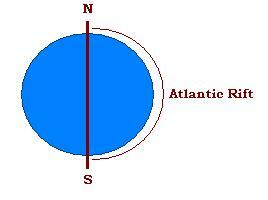 Earth's magnetic N. Pole is pushed away daily as Earth's rotation turns it to face the direction of Planet X. As Earth's rotation continues, it eventually brings Earth's magnetic N. Pole below the horizon from Planet X. Earth's magnetic N. Pole escapes the assault of magnetons emanating from the N. Pole of Planet X which allows Earth's magnetic N. Pole to attempt to return to its normal position. Thus it bounces back in opposition because the magnetons from Planet X are no longer pushing it away.